It is Monday and the day I have not been looking forward to. I have to remove my beautiful nails. Now I don’t really have plans as to what I will do but I will end the day at the nail salon. I have a meeting tonight at 6 so my plan is to find a nail salon about 3 and have my nails removed and that should give me time to get home and change back to my male self and make it to my meeting at 6. Now that means I want to enjoy a as much time as I can as Susan with my nails. I got up early and got ready. 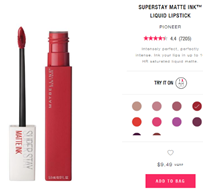 I have a new shade of red lipstick I wanted to try and even tough it might be a bit bright for the day it matches my nails and that is what matters. I got all ready and was on my way. I figured I would go back to Cascade Station by the airport as they have some store I wanted to check out. My first stop was Target as they open early. I got there just before 9 and went in. now I wasn’t really looking for anything special it was more just being out shopping. I looked at clothes, shoes, electronics and of course the makeup section. In the end the only thing I bought were some makeup wipes. I left here and went over to Ross Dress for Less and went in. I spent some time here looking at dresses and I ran into another transgender person and we talked as we shopped. She is transitioning although other than her purse and heel you would not be able to tell. I did find 1 dress that was really cute and so I bought it. It was now after 10 so all the stores were open so I went to DSW shoes and looked around, I found a few cute shoes and tried them on but they were all just too tight. My shoe size is between a 10 and an 11 depending on the toe width so I guess I am luckier then most t-girls in that fact. I also went into the Nordstrom’s Rack and looked at shoes and then a quick stop at ULTA and got some face powder. My next stop was Best Buy and again just to look around. It was a little after 11 now and I figured I would stop at the Starbuck’s here for a break and to write my blog from yesterday. They were busy but not as busy as yesterday and there was one table open by the door so I set my computer on it and went and stood in line to get my drink. I finished my blog and then started surfing the internet. Now there is a new movie out called Shazam which I kind of want to see as I remember as a kid watching it on Saturday mornings. Now it just came out Friday so I will have to wait a while as I hate going to Movies when they first come out. Now what caught my eye was the movie Bohemian Rhapsody, I have heard how good this movie is from so many people and I really wanted to see it but thought it was out of the theaters but it is still playing at the Fox Towers downtown and they have a showing at 1:45. I looked at the time and it was 12:45 so I could make it if I hurried. I have to admit going to the movies as Susan is way more fun then as my male self. I debated it for a few minutes and decided to go as I really wanted to see it in a theater. I parked and went in it was about 1:30 so I got there just in time. I bought my ticket and went into the theater and found a seat. I figured being a Monday afternoon there wouldn’t be many people there but to my surprise it was almost full. Now going to a movie is one of the easier things because it really is the going in and going out where you are noticeable nice the movie starts and the lights go down you are just another body in the dark. Now I grew up n Queen songs and the movie was awesome, as good as everyone told me it was. It is long though over 2 hours but so worth it. I walked back to my car and looked at the time, it was almost 4:30. That’s when I remembered my plans for the day. I was downtown Portland at 4:30 as Susan and still have my nails and have my meeting at 6 only 1 ½ hours away. With traffic it would take me almost that long to get there. I quickly called and made an excuse as to why I wouldn’t be there tonight as I cannot show up as Susan. On the bright side I get one more day with my nails. But tomorrow I can’t make the same mistake as on Wednesday I have to be at work. I headed for the Starbucks by my house as I figured that would be a good place to end my day before going home. I got there about 5:40 and went in, they were a little busy so I had to sit at a table in the middle by the door but my computer is fully charged so I am good for a couple hours and I am sure a table will open by the window and I can move and plug it in then. I wrote part of this blog tonight while it was still fresh in my mind and will finish it and post in the morning. 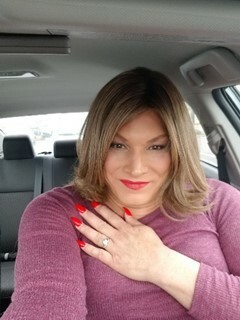 I did get a couple selfies also including my nails which I get to keep 1 more day, this means I will have had them for 2 full weeks as I got them on Tuesday March 26. This is the longest I have had long red nails. By the way I measured them and they are ½ inch long past the end of my finger. I stayed here till a little after 7 before I left. My next stop was Wendy’s for something to eat. There is a Wendy’s I go to as Susan and I first started going here a couple years ago as they had an all-female staff. It took about 15 minutes to get there and I was surprised how many cars were in the lot for almost 8 at night. Now as I said they had an all-female staff but over the last year I have seen 1 or 2 males working here but tonight it was about a 50/50 split. There were probably 7 males working here, now being a fast food restaurant most of the employees are high school age or slightly older but not one of them seemed to even noticed anything different about me and treated me just like any other customer. It was about 8:30 when I headed for home and my last night with my nails, tomorrow will be so sad. Thanks for reading and be sure and read my most recent blog to see what is new in my life. It is Friday and I have another day off so it will be a Susan day. This will make 3 days in a row, Wednesday night dinner and Thursday out shopping and now Friday. I started getting ready with the hopes of being on my way by 9 am which I didn’t make. It was about 9:30 when I left. My plan was to go to Washington Square and walk around and do some shopping, not really looking for anything I need but more to be out and see if I can find something I need. I got there a little after 10 and parked by Nordstrom’s and went in. the mall was not really busy yet so it was easy to walk around. I checked out several stores and looked ay some clothes but nothing I really wanted, well there were a few things but they were not even close to my size. I spent a little over an hour here before leaving. Now I wanted to get closer to home to avoid traffic but I did stop at Fred Meyers. I have only gone to Fred Meyers a couple times over the years but several if the girls were telling me they have a pretty good clothes selection. I didn’t find anything but it was still fun. From here I drove back close to where I live and went to a Starbucks. It is one I have gone to a couple times before. Cassandra texted me to see if I was out and wanted to meet for dinner and of course the answer was yes. We decided on Old Town pizza downtown Portland. Now the funny thing is I went through Portland on my way to Starbucks so now I will be going back to Portland. We decided on an early dinner about 3 so I had a little over an hour at Starbucks so I was able to write my blog from Thursday. It was about 2:30 when I left for Old Town Pizza. I got back downtown Portland and I actually found a parking spot right in front of the door to Old Town Pizza. Now it was pouring down rain so I sat in the car for a few minutes but it didn’t let up so I broke out my umbrella and went in. now Traffic was bad so Cassandra was a little late. Cassandra finally showed up about 3:30, it was great to see her again. This is her second time out this week which is awesome as she has not been out much the last 6 months. Now I will get to spend a lot of time with her as we are going to Diva Las Vegas together, 12 days as Susan. I will of course be Susan the whole time, Cassandra with only be Cassandra in Las Vegas, we talked about Diva Las Vegas and signed up for the events we want to do. We are both really looking forward to it. We have I think 7 from our group going plus a couple thinking about it so it will be a lot of fun. We ordered pizza and had a really dinner. It really was nice to get together with her for a few hours. It was about 5:30 when we called it a night, now I probably won’t see Cassandra till March 26th. I will go get my nails done that day yes, my acrylic nails and then go over to her house late afternoon. Cassandra and her wife are awesome and let me stay there the night before we leave. We are hoping to be on the road between 2 and 3 am as we are planning on driving all the way to Las Vegas on Wednesday morning. 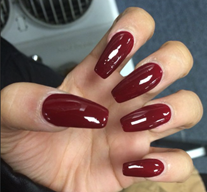 Now I am really looking forward to getting my nails done, this year I am going to try a little different look a coffin shape. I have been looking at pictures and am still deciding on a color, I really like the bright red but a deeper read is also nice. Color aside this is the shape I am looking at getting. I just know it will be awesome to have them for 12 days. I really wish I could have my nails like this all the time. Now I did get a selfie in the car before I left for home. Now this time of night I was caught in rush hour traffic so it took me an hour to get home but it really was a fun day out. Thanks for reading and be sure and check out my most recent blog to see what is new. It is Thursday and I have today and tomorrow off work so they will be Susan days. I do need a couple things so I figure I will do a little shopping as it is something to do. Now again the difference between my male self and Susan. My male self is not a big shopper, I go to the store, get what I need and go home. Susan on the other hand likes to walk around and shop. The two things I really need is foundation and lipstick, yes, I have my favorites. So, this means a trip to Walmart and a trip to Nordstrom. I got up early and worked out, yes, I am going to try to get back in the habit of working out as I want to lose some weight and also get in shape more as I am not getting any younger. I started getting ready about 7:30 am and was on my way by 9:30. Now as I said I want to go to Walmart and Nordstrom’s which is at the mall. I figured I would start at Walmart as there is a Super Center at Wilsonville and then I can come back to Clackamas Town Center to finish off my shopping. I was on my way and even ow there is still traffic so it took a little while. Now the funny thing is it turns out the Walmart is in Woodburn which is about 12 miles further. Yes, Portland does not have a Super Center as the city felt they did not pay enough and would not let them build in the city. They have since changed their minds but with all the Super centers around the city all they have built in Portland are a couple small neighborhood Walmart’s. well it took a little longer to get to Walmart but that was okay. I got to Walmart and went in, I got a cart as I figured as long as I was here, I would do my other shopping also, seems a waist to drive this far just for lipstick. I wandered around the store for a while and got some food and cleaning supplies. 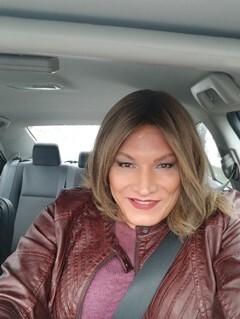 It really is nice being out just doing daily stuff like shopping as Susan. Life really has changed over the last 10 years. I use to go shopping for Susan as my male self (trial and error), then I got comfortable as Susan and only shop for Susan as Susan, and now I am shopping for my male self as Susan. I guess I have come full circle. Now with the things I need for my male life it is now all about Susan. I left here and drove to Clackamas Town Center and went into Nordstrom’s. my first stop was the MAC counter. Now I have seen men working here before but today it was just two men working. They were both very pleasant and helpful and asked if I wanted to try anything. I really did but didn’t want to mess with my makeup so I just told him what I needed. All my makeup are what would be callled drugstore brands, Maybelline, Covergirl, Loreal, but for my foundation I really like the MAC Studio fix. It is a full coverage foundation that still looks natural and yiu can build layers if you need mire cverage. In my mind it is worth the extra money as I don’t havve to use asa much. 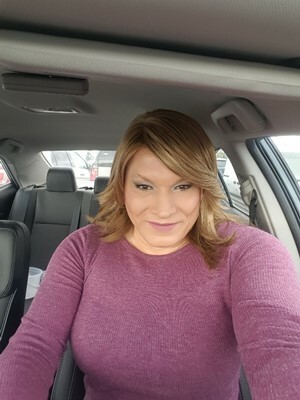 Now that I had my lipstick and foundation I was good so it was out into thhe mall for some fun shopping. I wandered around looking it really was more just being out. I did go into Victori’s Secret to look around. I have two bras I bought here and they are fabulous, the most comfortable bra’s I own. They are a little pricy though $49.95, now they had signs up for a sale, buy 2 get 1 free. they are called So Obsecced pushup bras. I looked around and couldn’t find them so when the young lady came and asked if I neede help I told her what I was looking for and she told me they were not getting them any more. I can’t tell you how many times I have found things I like only to have them discontinued. I left the mall and drove to Wendy’s for a late lunch. After that I went to Starbucks, I went to the one by my house. I haven’t been to this one for a while as they close eary but it is during the day and as I have to be home by 3 it works out. Now I wrote my blog for Wednesday night dinner and then just surfed the internet. I did go onlie to Victoria’s Secret and they stll have some of the bras I like in selected colors so I ordered 3, 2 plus my free one. Now I don’t do a lot of online shopping but when I do it is fun, I used my Susan credit card, and I am having it shiooed to Susan at my address. I stayed here till 3 before going home as I have some things I have to do tonight and I can’t do them as Susan. I did get a selfie today too. 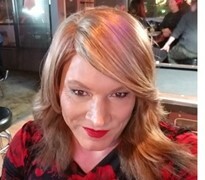 The lipstick I am wearing in this picture is Maybelline super stay lip ink in Fighter which is a a brown color with a touch of copper, a good daytime color. Thanks for reading and be sure to read my most recent blog to see what I am up to now. The week has been busy, I had hoped to get out to dinner with my friends on Wednesday night but it was after 6 when I got home. So, I was setting my sights on Thursday as I have till midafternoon free. I got up Thursday morning and started getting ready. I was ready a little before 10. I was going to Lloyd Center for a little shopping. I got there about 10:15 and went in. Now Lloyd Center is not busy and has not been for a long time at least when I have gone. Nordstrom’s closed a while back and Sears will close on April 8th and there are a couple other stores that have signs in the windows everything must go so guessing they will also close plus there are several that are empty or closed. I am wondering if the mall will survive. Any way my first stop was Sears to see what they had left which is not much but pretty much everything is 50% to 60% off I looked through the clothes and shoes and they are pretty well picked over at least in my size. From here it was out into the mall, I went into Suncoast, Macy’s, Ulta, Ross, Torrids, and a few others I can’t remember the names of. It really was more about just being out for a while. I even spent a little time in Barnes & Noble which is a good place to pass time. It was a little after 12 when I left Lloyd Center. Now as I said I don’t have a lot of time today as I have to be someplace at 4 as my male self so I decided to get closer to home so I don’t get caught in rush hour traffic later. I decided I would go to Starbucks for a while and I decided to try a new one, turns out there is one right next to the Wendy’s I have been going to so that was where I would go. I got there about 12:30 and went in, wow they were really busy and there was only 1 table open right by the door, and there were 3 people in line so I set my stuff down on the table and went and ordered my drink. There were also a lot of young kids who came in but they all got drinks to go. There was also a draft every time the door opened probably why this was the last table open, glad I got a hot chocolate today. I stayed here till 2:30 before heading home. Thanks for reading and be sure to see what new in my life on my most recent blog. I got to Lowes, parked and went in and sure enough it was mostly men there shopping. Don’t get me wrong woman can and do shop here but it really is more men. Now I knew what I wanted but I did take time and walk around and look at other things and yes, I did get a few second looks from some of the men but nothing was said so that was good. I did see a hand full of woman in getting things so I wasn’t the only female here but we were really in the minority. I finally made it over to the plumbing section and found what I was looking for. With my purchase in hand I headed for the checkout and to my surprise there were no lines. I got paid and was on my way. Next stop was Walmart which is just up the street. They also were not as busy as I expected but then it is a Monday morning. I did take time to check out their makeup section as I really love looking at makeup. Then I did the shopping I needed to do. After I left here I made a quick stop at Target before heading back towards home. I wasn’t ready to go home though as it was only about 12:30 and I have till 2 or so before I have to be home and change back from Susan. I decided to go to Starbucks but instead of the one by my house I wanted to try a new one that have never gone to before. There is one just down the street from the one I go to on Mill Plain so that was where I was going. I was trying to think of all the Starbucks I have gone to over the years in Vancouver & Portland, I am guessing I have been to at least 12 in Vancouver and probably that many or more in Portland. Starbucks really is a good place to go as most people there are by themselves or very small groups and they are usually doing something, reading, school work, on a computer or cell phone and are busy with what they are doing. It is also a good mix of people and mostly people coming and going. The one I went to is at 12101 SE Mill Plain Blvd Vancouver, WA 98684. It is a smaller one inside but it was not very busy so there was no problem getting a table. I got here just before 1 and spent about an hour here before heading home. Thanks for reading and be sure and keep up with what’s new in Susan’s life on my blog. It is Friday and I am going to Clackamas Tow Center again to go shopping with Melissa & Mikaela, we are meeting at 11am. I started getting ready about 8:30 and of course I was still deciding what to wear as I was doing my makeup. It has been a fun week but as all things it must come to an end as I have something I have to do tonight which means the red nail polish will have to come off. I will have to be home by 5 so I can remove the nail polish and change back from being Susan but as I said it has been a great week and today will be just as fun. I was ready to leave a little after 10 and on my way. I got to Clackamas Town Center about 10 minutes early so I texted them I was there and both were just parking. Melissa was the first to show up so we talked for a couple minutes till Mikaela got there. Mikaela brought her daughter who is almost 2 and so cute, what could be more fun than 3 women walking the mall this way. We started off with lunch in the food court which was nice although I ate to much, no dinner tonight. We sat and talked and caught up and Mikaela and Melissa got to know each other as this was the first time they met. 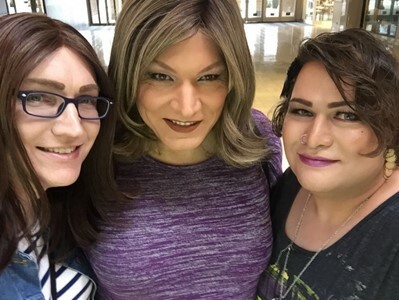 Of course, we had to get a group picture of the 3 of us at the mall also. It really is more fun to go shopping with friends. Now it really wasn’t about the shopping it was more about being with my friends. We mostly just wandered around the mall talking and looking and having fun. We did go into several stores, even the tow stores as we had Mikaela’s daughter with use and this was a lot of fun as I got to look at toys for little girls. Mikaela really is a wonderful mom. We went into several stores and Mikaela bought several things, she likes to shop, she even bought so candy for her wife and also some other things. I saw some cute things but nothing I just had to have so I was being good. One of the stores we went into was called Maurices and I had never been in there before. It is similar to Torrid as it caters to the larger size which I seem to fit into. They had some really cute things and I did find a maroon color leather coat which was really cute, size 2 and what do you know it fit me. Now I am not a big coat fan as even in my male side I only wear them when I will be outside for an extended time. Even in winter I am more likely to have on a sweatshirt than a coat. But I have thought I should have something as all I really have is a couple thin wraps, a sweater and my heavy wrap. I thought a coat would be nice and it was on sale for 75% off so it was only $17 just too good to pass up. We walked around and talked some more and we got on the subject of Facebook, now this may get me in trouble but what the heck. We got talking about all the negative stuff on Facebook yes talking mostly about political stuff and it is on both sides. I brought up how I was tired off all this negativity and I have actually just overlook some as there was just so much. Now I am not saying you don’t have that right as it is your Facebook page but remember all your friends see it and trust me not all your friends feel the same even if the vast majority do. We all have different views beliefs and that does not make us better, or worse just different. I want to view Facebook to see what’s going on in your life not to be given a political, or religious lesson. I want to know about you not how bad someone else is. I don’t even look at these posts anymore. It was after 2 and Mikaela had to leave as she lives an hour south and wanted to try and beat traffic. Melissa and I hung out a little more and walked back down the mall and to the outside part where they have a few more stores including a Charming Charlies and a DSW. We went into the DSW and looked at shoes, Melissa is looking for some casual tennis shoes and I am kind of looking for some nice flats I can wear. Found a few pairs but not in our size. It was almost 3 when we walked back to Barns & Noble and walked out to our cars. It was a fun day with my friends. Thanks Melissa & Mikaela for going shopping with me. I got home and yes, the first thing I did was remove the red nail polish, it was sad to see the red go. I will be out Saturday night with my friends again but no Wednesday night dinner this week as it is Valentine’s Day, so I am wishing you all a wonderful Valentine’s Day. Thanks for reading and be sure and keep up with what’s new with Susan on my most recent blog. Okay Tuesday morning I got up a little later after all this is my vacation. Peggy and I are going to meet at Clackamas Town Center at 2 so I do have some time before we meet. I got all ready and was on my way, I got to Clackamas about 10:30 and decided to go to the Promenade across the street mainly because I wanted to go to the Nordstrom’s Rack and look at purses and shoes and yes, I am using my new purse today to see how it works. So far, I am liking it, there are things I don’t like about it but a lot more things I like and I think it is just a matter of getting use to something new. My first stop was Nordstrom Rack and they had a nice selection of purses but none in the style I am looking for, very few black ones and the ones they did have were either small or huge so I headed back to the shoe section where they actually have a nice selection up to size 12. Now I am a size 10 to 11 depending on the toe width. Now to my surprise there were 4 other women in this size section looking for shoes and yes even 1 man. I had to wonder to myself if he was looking for himself. I looked around for a while and even tried on several pairs. I found 1 ankle boot that fit but it had the long pointy toe which I am not a fan of, I think they make my feet look bigger. I also walked down to Kohls and looked around for a bit and also stopped in beauty first to look around but this is more of a beauty salon so I didn’t stay long. I then walked down to Target and looked around for a while. It is funny as I have come here before and shopped all these stores but I would always park as close as I could to the door, go in and then drive through the parking lot to the next one. Now I just walk between them and leave my car parked. It was now after 12 and I am meeting Peggy at 2 at Nordstrom’s in the mall so I figured I would drive over to the mall as there is a Starbucks there and get a drink and a snack as I haven’t eaten yet today. By the way wearing a corset helps you cut down on what you eat, yesterday I had my lunch at the mall and never thought about eating as I wasn’t hungry, at least till I took off the corset last night. I may actually loose a little weight this week. I am also not wearing the corset today 12 hours yesterday was enough so taking a break. Now the Starbucks is right inside the main entrance and of course parking I bad there so I had to park way out and walk in. as I got close I saw the Sprint store which is where I have my cell phone through. I have had my current phone and plan now for almost 3 years (in May) so I am interested in what they have to offer and of course a new phone. I decided to go in and talk to them as Susan of course I kept it general and didn’t tell them I was a current customer. Now there were two girls working and one had on this beautiful red lipstick of which I just had to compliment her on as you don’t see a lot of woman wear red lipstick. Anyway, the other girl helped me and she was very nice and gave me all the information I wanted. I am planning upgrading my plan and getting a new phone as it appears I might even save just a little money each month or at least be cost neutral. The question is do I do it today as Susan or come back later as my male self. Well I have all day to think about it plus I will be here again on Friday with Mikaela. Now the Starbucks was right next to the sprint store so I went in and got a snack and killed some time till it was time to go meat Peggy. I met Peggy just before 2 and it was great to see her, always more fun to be out with someone else as you have someone to talk with. Now for the first 30 minutes we just kind of wandered the mall talking and catching up, Peggy told me about her vacation she just got back from. It was very enjoyable. Once we had caught up we went to Nordstrom’s as Peggy was looking for a lipstick and I needed more foundation, I really like the MAC Studio fix. I can use regular foundations if it is for a few hours but if I am going to be out any length of time the MAC just holds up better. The lady that helped us was awesome, her name was Sandra. She helped Peggy find just the right lipstick for her and also a blush and then of course got my foundation which I already knew what I wanted. She then told us they were doing a makeup event March 4 to 10th and asked if we wanted to come in for a makeover. This really sounds fun and I am thinking about it I just couldn’t commit this far out. She gave each of us her card with the dates on it and told us she would be there on the 9th & 10th if we wanted to schedule with her or any of the girls could do our makeup. We checked out a few more stores before going for a mid afternoon lunch, we went to the Cheesecake Factory. Now we were good and both ordered salads. We had a wonderful lunch and again sat there talking, our waiter by the way was awesome and checked back on us regular to see how we were doing. After we finished we sat and talked some more, it was a wonderful time. It was about 4:30 when we left and went back into the mall, we decided to check out a few more stores because if we left now we would both be caught in rush hour traffic so why not shop a little more and let traffic die down. Peggy found a really cute pinkish dress and some really cute sparkly tennis shoes, I was just having fun looking around. The funny thing is she was also looking for things for Cassandra. We spent about another hour in the mall before heading for our cars. It was about 5:30 and we would still have traffic but hopefully not as bad. We actually parked only a few cars apart. Hopefully I will see Peggy again in a few weeks when we go to Harvey’s Comedy Club, Julie Scoggins is coming and she is one of our favorite comedians. Now believe it or not on my way home I hit no traffic so I was home by 6 well not quite as I stopped at the Starbucks by my house for a little while. It really is funny as I never thing or go to Starbucks if I am not Susan. 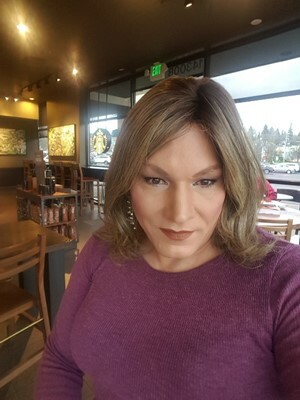 I think I have only gone here maybe 4 times as my male self and 3 of those were time I was on vacation and had my nails painted, Starbucks is defiantly a Susan outing. Now there were about 10 people here at the table next to me was 3 ladies and 2 men and I noticed one of the girls kept glancing over at me. N ow the interesting thing is as she would glance at me there seemed to be something familiar about her. Now I am pretty sure I don’t know her and it was just the fact she was looking at me that made me feel this was. I stayed here till about 7:30 but I was a little hungry and I was trying to figure out what I wanted to eat. Now they opened a Domino’s pizza a few blocks away and I have gone there 3 times over the last 3 to 4 weeks and I liked the idea of going in there as Susan just to see. Now they do ask for a phone number when you order so that was my only concern. Now I have herd you can get a phone number from Google for free to link with your own number. Well a quick search and I found google voice. Just to see what would happen I selected a phone number and wow, it was attached to my account and linked to my cell phone. I can send and receive text messages make calls and if I want have them forwarded to my cell phone. I got to Domino’s and went in, now there are about 7 people working here and 2 of them one female and one male have been there each time I have been there. I ordered my pizza and gave them my new google phone number. About 10 minutes later out came my Pizza and the girl said here you are Susan have a good night and I was on my way home. It has been a wonderful day. Thanks Peggy for going shopping with me. I got to Lloyd Center and parked by Sears and went in, guess what this is one of the Sears stores they are closing everything is 10% to 50% off well everything I saw was marked 40% off. It is sad as I have loved shopping this store and I have a lot of outfits from here but I guess change happens. It is funny as the two stores I by the most from here are gone (Nordstrom’s) and soon Sears. Now I admit I don’t spend a lot at Nordstrom’s but I do like the MAC foundation Studio Fix, it’s a little spendy priced but it works so well covering up things that need covering. I looked around Sears and they are somewhat picked over but they did have some purses but not the kind I was looking for. My purse I have is really your basic black purse but it is the perfect size and shape and fits so well on my shoulder. Of course, it maybe I am just use to it and please don’t laugh as it is the first purse I ever bought for going out, I have had it for probably 15 years and it is showing its age. Now I did find one that wasn’t bad and I was thinking of getting it so I decided to let fate decide. When I was done shopping here at the mall I would have to walk back through Sears and if it was still here I would get it. 40% off it would only be $32 for a leather purse, I will probably still look for one like mine this week but in case I don’t find one this will do. I know a lot of woman have a ton of purses for every outfit but I have always been that classic go with everything black purse. Besides that, way I don’t have to move things around. It is funny as everyone has the things they love and buy a lot of or maybe too much of, some buy heels for me it is lipstick. I really do have way too many lipsticks especially when you figure I only wear them a couple days a week. Well I ventured out into the mall mostly just window shopping although I did go into Ulta Their prices are a little higher than the drug stores for the same items but they have such a wide selection and you can usually find things you can’t always find at the drug stores and yes the first thing I looked at were the lipsticks but I didn’t buy any. I also stopped in Torrid, Macy’s, Ross Dress for Less and spent a little time in Barnes & nobble which is a wonderful place to spend some time. I even watch some people ice skating for a while, it was just a relaxing time wondering the mall and of course people watching. This mall really wasn’t busy probably just because it was a Monday morning. I went up to the food court and got something to eat at Sarku Japan, Chicken and Rice as I wanted something other than a burger. After I ate I finished walking the mall and stopped in Suncoast movies just to look and see what they had. Before heading back to Sears to see if fate had left my purse there. Sure, enough it was still there so I picked it up and as I was going to the register I saw some wallets and yes, the wallet in my purse is just as old. I found a small one that was kind of cute and what was cool is it has a detachable hand strap so I could use it as a small purse if I wanted. Wouldn’t hold much more then money, ID, keys, a lipstick and I think my cell phone would fit and it was only $5 so I couldn’t pass that up so those were my purchases for the day. It was almost 1 now and I was trying to think what to do now. If I stay much longer in Portland I will get caught in traffic so I decided to head back closer to home. As I was going down the freeway thinking if I should just go to Starbucks it hit me. I could go to the new Casino Ilani, I have been her 5 times so far since they opened, 4 times as my male self and only once as Susan. Now of the 4 times I went as my male self I won about $50 the first time the other 3 tgimes I lost $60 the last time I was there as my male self I kid you not, $60 I played 13 hands, I pushed once and lost the other 12 and the sad thing is I only went bust once. The dealer never went bust one time, that trip I was only there about 10 minutes. Now the one time I went as Susan I also won so I was hoping Susan would be lucky. I got there about 1:20 and parked and of course had to get a selfie before going in. I am not sure if you can take pictures inside, I may try if I get the chance. Now this is a really busy place and not far from where I live so that does make me a little nervous, last time I was here I did see a couple people I knew but thy were not people I knew well and had not seen in years. I walked through the casino to the Black Jack tables and looked around. Now for a Monday afternoon they were kind of busy, they had probably 25 tables going but only about 10 or 12 were black jack. There was one table with an open seat between a young man and a woman and there were 3 other men at the table. I stood there and watched for a few minutes and the young man asked if I wanted to play as there was an open spot. I did so I started to get my money out before sitting down as not to slow the game down and to my surprise as I was getting my money out this young man pulled the seat out for me, wow how awesome is that. Now not one person at the table gave me a second look and they we re all very nice and talkative and I was just another woman at the table. Well as I said I have not had much luck here so I only took out $40 to see how I would do. Now it was n ever a really hot table I think the most I got up to was maybe $70 and the lowest I got down to was maybe $15 I was just up and down but having fun and talking with the people around me. Our dealer was wonderful and she was very friendly, she told us stories about some of the players she had and some of the big wins and losses and of course everyone at the table had their own stories. She went on break a few times and the replacement dealer was just as nice. A couple of the people left and others came in and again I was just another player at the table. The last time our dealer went on break the replacement got hot and people were dropping at the table was down to $25 and got a couple hands of 11 against a dealer 5 and 6 and doubled down both times and wow I lost both so I was down to my last $5, I won the next hand and then lost 2 in a row and my $40 was gone but I had a fun time. I got out my phone and looked at the time and it was almost 5:30. I had been sitting at the table for almost 4 hours straight which brings me back to my corset. Now sitting at the table, it was a little uncomfortable with the corset on now but I have been wearing it for over 8 hours so I kind of expected that. I got up and left the table and walked back through the casino and out the door to my car. The funny thing is by the time I got to the car I was not uncomfortable any more, I think if I had got up and moved some I would have been fine. I left and drove to the Starbucks by my house and went in. They were a little busy 5 people waiting to order and a few waiting to get their drinks but there were a few tables open and I figured most would get their drinks and go. I got to the counter and the young lady said Hi Susan, right? And I said yes. She asked if I wanted my sweetened green ice tea or a hot chocolate, how is that for remembering me. I got the green ice tea as it was actually nice outside. I sat down and started this blog about today and also caught up on some e-mails. I spent about 2 hours here before leaving a little after 8. I got in my car and notice I needed gas if I was going out tomorrow again so I drove down to Costco as they are open till 8:30 and the fuel station till 9. I pulled in the parking lot about 8:20 and as the store was still open I decided I would go in and talk to the membership people. I actually joined Costco last November and I was wondering about going there as Susan. The lady at the counter was very nice and I just explained that I live part of my life as Susan and was wondering about getting a card with my female picture on it. She talked with what I assume was her manager and then she said she could and asked for my ID and membership card to pull up my account. Then she gave me a piece of paper and asked me what name I wanted to use so I wrote down Susan Miller and from then on, she called me Susan. She put information in the computer and then took my picture and that was it. I now have a Costco card with Susan’s picture and name on it. It has been a fun day. I got home a little after 9 and I was ready to remove my corset which I have now worn for a little over 12 hours straight. Wow another long blog, thanks for reading and be sure and keep up with what I am doing on my most recent blog. Okay it is Sunday evening afternoon and I wanted to go out again for a little while. After cleaning up and changing I was ready. Of course, I am wearing the new lipstick I bought, turns out when I bought it I was worried it would be too light and not real noticeable, its darker than I thought. My first stop was the Starbucks by my house to write my blog from this morning. It looked kind of a light brown color that would be a natural day color but now that it is on kind of looks like it has a little copper color to it. Still deciding what I think as in certain light it really looks nice but in other light not so good. Here are a couple pictures of me at Starbucks so you can judge for yourself. I got to Starbucks about 3:30 and they were really slow, just 2 other people here and not many came in while I was here. Guess everyone is home watching the Super Bowl. As I said I am not a football fan so I would not be watching it even if I were at home. Now I spent a couple hours here before leaving and going back to Cascade station for a little shopping well more looking then shopping. It is just fun to walk through the stores and look at things. Now I did go back to the same Target I was at earlier as I wanted an eye shadow. For the Smokey eye look I have been doing I have been using an old white eye shadow for the inside corners to brighten them up. I am almost out of it and besides it really should be a silver color for the look I want. 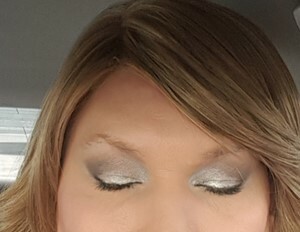 I have been making do with what I had while I got better at doing the Smokey eye look. I found what I was looking for just a single color in silver and only $2.99 from Maybelline and I will try it tomorrow. From here I went over to the main shopping area and started with DSW shoes just to look around, also went into Ross, Staples, Bath & Body works, Nordstrom Rack, Ulta, and last Best Buy. It was a relaxing evening just walking through the stores, the only bad part was being Sunday the stores closed at 8 pm so it was kind of a short night although there is a Star bucks here I have gone to many times before that is open till 9 so that was my last stop, same one I was at earlier and one of the ladies was still there from earlier she must be working a long day. I worked on this blog till they closed, the one cool thing about Star bucks is they don’t usually kick you out right as they close as they have cleanup work to do and they will let you sit there for a while so it was about 9:20 when I left. On the way home, I made a quick stop at Fred Meyer to pick up some groceries and then a quick run through Wendy’s drive through before going home. Now I know this probably sounds pretty boring but you have to stop and think about it. 10 years ago, it took all I could do just to go out after dark to a gay bar, 15 years ago it was a late-night drive and maybe Burger Kings drive through and before that I couldn’t even imagine leaving my home. To just be able and go out and do every day things that all woman can do is really amazing. It shows how far not only I have come but the community in general. 20 years ago, you could have never convinced me I would be going anyplace as Susan. Thanks for reading and be sure to see what’s new with Susan on my most recent blog. It is Super Bowl Sunday for those who love football this is the day they look forward to all year long. Me I am not a big fan of Football. now we are not able to get together this year for Super Bowl and yes, I could go to the Escape or Sweet home and watch the game but as I said it was not the game that I liked it was the people so instead of that I figured I would do a little shopping. I got up this morning and would do some work I needed to do before I would go out as Susan, my hope was to be out by noon. Well things don’t always go as we plan. You see I have some work to do on my deck and that was my morning job, well imagine my surprise when I got my drill out to find it didn’t work, crap looks like a trip to home depot. Now I must say my drill is old I got it when I was in high school many years ago and it has served me well. Any way now the fun thing, Home Depot as Susan why not. I wanted to do some shopping any way. I was dressed and on my way by 9:30 with my first stop Home Depot. Now it is a little strange to go here as Susan shopping although I think I have done it once before, will have to look back through my blog. I got to Home Depot and went in, not a lot of Woman here on a Sunday morning and even less with makeup on but that’s okay. I found a drill and a couple other things I would need and then I left. Now I was at the Home Depot on Airport way so my next stop was the Starbucks at Cascade Station for a drink and a pastry and to write my blog from last night’s wonderful dinner. I spent a little over an hour here, they were really busy but it was relaxing and fun, just a little me time. From here I went down the street to Target as I need some face powder which I ran out of this morning and a new mascara. My mascara is old as I only use it a couple times a week I don’t go through it that fast. One reason I don’t by high end mascara. I don’t think I have ever used up a tube of mascara, they say you should replace every 6 months. Now being something, I use so close to my eyes I am willing to not keep them as long although longer than 6 months. It was almost noon now and I was hungry and I was also looking for a new lipstick. 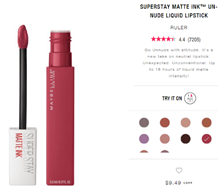 I have been trying the new Maybelline matte lip inks. They stay on really well I have several in red, pink, & mauve but they have some new ones out in nudes and browns more of a natural color that I wanted to try as that would be better for a daytime look. I stopped at Walmart and found a nice color now again it is hard to judge just by looking at it but the one I picked is kind of a tan brown so I got it, then I hit McDonalds on the way out, yes Walmart has a McDonalds inside. It was a little after 1 when I got home. Now the work I needed to do on my deck was to remove some old board that broke on the trellis it really would only take about 15 to 20 minutes with the drill to remove the screws from the old boards and put the new ones up. I looked out side and the neighbor behind me blinds were pulled but 1 so I decided I would do the home improvement as Susan I got my ladder out and went out on the deck. Got all my stuff on the deck so I was all ready to go. I climbed the ladder and removed the old boards and then put the new ones up and I was right the whole thing took less then 20 minutes. Now I have cleaned my house before as Susan, done laundry, cooked dinner but this was my first home improvement outside. It really was easy as Susan with the exception of my long hair. And my back yard is pretty private other than the one house behind me it would only be the house either side of me and they would have to be out on their back yard. Now I wanted to go out again for the rest of the day but after that hard 20-minute work I would need to clean up well that and I wanted to redo my makeup and try my new lipstick. I can get so excited about things like that. Anyway, that will be my next blog and of course be sure to keep up with Susan on her most recent blog.